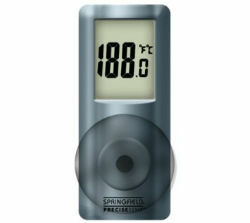 This compact thermometer goes anywhere indoors or outdoors with a weather-proof housing. The 3 ½” x 1.5” thermometer has an oversized reversible suction cup that will stick to any window, inside or out. It will monitor the temperature in Fahrenheit and display it on a clear LCD screen (1” x 1.25”) with extra-large digits for easy reading. Don't let the compact size fool you, this is an easy to install and easy to read thermometer. Temperature range -4 to 140°F and -20 to 60°C.